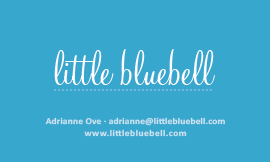 Little Bluebell: Blog Spring Cleaning? It all started with a need for a card to hand out to people who ask me about my blog in person. *gasp* What do you mean I can't just send them a link? This little exercise led to me dragging out some of my old design books. Here's what I came up with. and a new about picture. Is this blog spring cleaning? I think so! And there might be more where that came from. Now to write that about page. Why is so challenging to write about yourself? Also, do any of you have a printing service you use and recommend? I'm looking for nice but not too expensive business cards. Hello from another Northern Californian! I use Vistaprint for my company's business cards (a car dealership - so we go through a lot of them!). The cards are SUPER cheap and look pretty nice. Love the look of your blog. these look like fun to try. especially since you could back it with lots of different pictures of your sewing projects. some days I wish I had a little shop, but mainly to be able to use/have all the cute branding items. little tiny picture stickers?! I've got a major soft spot for cute office supplies. We print our own business cards for my office. Super easy, but doesn't allow for much in the way of color unless you have an expensive color printer. I love your new logo and your fab new photo - you look so sophisticated! So cute. I always love your graphic design projects. Your blog spring cleaning looks amazing. I have used Zazzle in the past and been happy with them. I love the new look!! I used overnightprints.com for my cards and I was super pleased. They were the most reasonably priced on rounded corners. (I don't have business cards so no comment there). Another vote for both overnight prints and vistaprints. Great products and service from both! Another vote for overnight prints. We've had trouble with vistaprints in the past, but they may be better now. But I've loved the quality of everything I've gotten from overnightprints. And they almost always have a sale going on. Looks beautiful and very professional! I've heard that Vistaprint is good. Everything is wonderful! clean and simple, just like your quilts! Lol, I may or may not be about to do the same thing... ;o) I haven't got any design books though, so I shall just have to wing it! I have had no trouble with vista print in the past. And they often have sales and "free" deals on. I love GotPrint! I work with a non-profit and look for both quality and economy. I quote local, too, but find GP's prices are pretty much unbeatable. I have been extremely pleased with the quality more than anything. I've used Vista and Overnight prints --- GP's quality in my opinion is bettter. Mostly I've had rack cards, brochures, and jumbo postcards printed up --- also, I've used the specialty shapes in the 4x6" size with good success. I think those specialty shapes would be neat on a business card! The do a 'leaf' style with two opposite corners rounded; there's circle and an oval. The square with rounded corners is super fun, too! Pillow Talk Swap 7, Received! !